Mayan Name: T´ZI / Oc. Compatibility: Dog, Jaguar, Flint, Wind, Death. 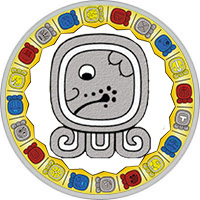 Mayan Dog Sign (Oc) — path, assistant, adviser. The Dog sign - the patron is God Tzul. The hieroglyph of the day depicts a Dog, but there is another option — the foot of a man. According to legend, the time arose in the process of moving the foot of God through the universe. A sign indicates the beginning of a calendar cycle. In Maya myths, a dog is an animal accompanying a person in a journey through the afterlife. Imitates loyalty, devotion. Thus, the Dog is a complex symbol: the foot of a man entering the gates of darkness, and a faithful Dog that can lead him through this darkness. The sign represents faith in the best, the triumph of the strength of the spirit. People of the Dog sign have an increased emotionality, express their feelings clearly. They are not able to control words and actions, they often upset their relatives with their antics. But there are no more faithful and loyal people in nature. The cheerful person of the Dog sign is able to enjoy every day, tries to share his optimism and energy with relatives. Sincere admires beautiful things and people, likes to eat deliciously. Strives to get all the best from life. But painfully perceives blows of fate, can become an evil, hypochondriac, closed person. Much in life depends on his behavior, it is necessary to develop qualities: concentration, restraint, moderation. By its nature, the person of the Dog sign — a romantic and a dreamer. Dull life, filled with routine duties, disgusts him. He will try to avoid the career of an office employee, who must follow a clear working schedule. His element — creativity, chooses the profession associated with the world of art. If fate forced to do the usual thing, try to become the boss. Often people from this day get good leaders who are able to show human emotions. They try to treat their employees attentively, their main qualities are honesty and honesty. Love evokes a strong emotion of the Dog sign. With all the passion falls on the object of his desire: endlessly sprinkles with gifts, arranges romantic dates. At the same time he suspects the chosen one of unworthy behavior, arranges stormy scenes of jealousy. After the conclusion of the marriage, he calms down a little, becomes a caring family man. Loves close people, touchingly protects their peace, tries to provide a comfortable life. But there is a danger of betrayal: a powerful sexual energy is looking for a way out. Too much attention is given to sensual pleasures, instincts are fully given. A decent man of the Dog sign evokes respect, the surrounding people treat him with sympathy. He tries to maintain good relations with everyone, but sometimes he is unrestrained in the manifestation of his feelings. It can easily offend a person with a careless word, but not out of a desire to offend — just expresses one’s opinion. His irrepressible love of life, the desire to experience only joyful emotions are the causes of misfortunes and troubles. Easily falls into dependence on bad habits, can become an alcoholic. A bright, spectacular Dog woman is an object of admiration and worship. He loves to dress up, the best gift for her is an exquisite piece of jewelry. Has a strong intuition, easily guesses the mood of people. Natural sexuality makes it slightly illegible in connections. She strives to get the full range of emotions from life, but in marriage she shows herself as a faithful, devoted wife. Always defends the interests of close people, cares about their well-being. Despite some lightheadedness, soberly assesses their capabilities, correctly sets life priorities.